Montrose Point, Chicago, Winter 2013-14. © Suzanne M. Coleman, all rights reserved. Do you remember this? Just last year we were braving the icy freeeeezing cold weather along Lake Michigan in Chicago. This year pales in comparison, so far… Even though it was ridiculously cold last winter, I’m glad I bundled myself up to go out because being there was an experience I will never forget. It was an amazing ice scape. Standing at the edge of the lake, cracking sounds surrounded me as masses of dark, unstoppable water moved back and forth under the covering layers of ice. Below me, pieces of broken ice piled up like pale blue puzzle pieces, a puzzle that was WAY too cold to complete. The sounds were eerie, yet fascinating. The power of that water overwhelmed me and I stepped back even farther from the edge, afraid of what it could do to me. Winter water birds sought out the limited remaining open water to desperately try and survive the coldest winter we’ve had in our area in a very long time. Here at Montrose Point, a group of colorful red-breasted mergansers were getting ready for bed at the edge of the lake. I marveled at their ability to withstand the cold temperatures. As I watched them, I heard tinkling and jingling sounds coming from under the overhang of ice which had developed along the concrete edge of the sidewalk. Below, it seems, a bird had bumped into a bunch of hanging icicles, causing them to fall and create amazing music in an otherwise very empty atmosphere. It was very pretty. 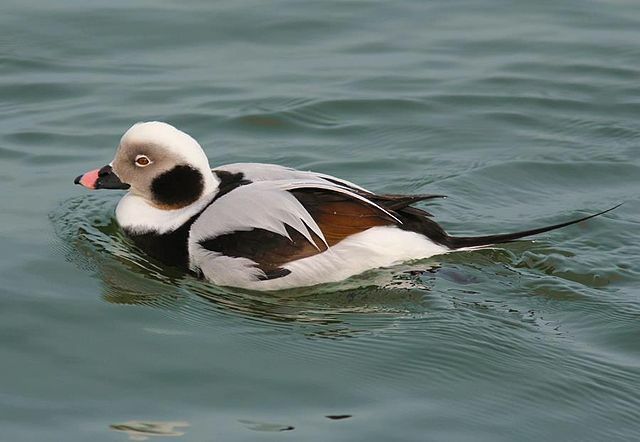 I had come down here to this very famous Chicago birding area, to see an uncommon bird, the Long-tailed Duck. This particular bird was a male in breeding plumage which means it was a very pretty bird to see; full of strokes of black and white all over its body, with a long, thin feather tail trailing behind. I found it thanks to the reports of other birders on the Illinois birding listserv (IBET); it was bobbing in the small bit of open water near the mouth of the harbor, along with a dozen or so other birds of various types. This little guy stood out. Not only was he beautiful, but he was really fun to watch. He would jump up into the air and then quickly tip his head down, at the same time folding his wings up like a fighter jet, and then dive down into the water to disappear completely from view. He would stay down there for quite a while, 20-30 seconds it seemed, then resurface in another location. I hoped that he was successful in finding something to eat, as I didn’t see any food in his mouth while I was there watching him. Of course, he could have been eating it while he was still underwater. 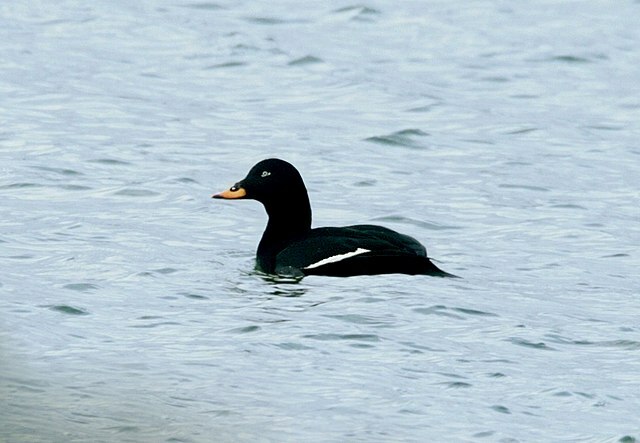 Also nearby was another special type of bird, the White-winged Scoter. In fact, there were quite a few of them there, several as close as 20-30 feet away, watching me watching them. All of these different types of water birds were there because it was the only small bit of open water that they could find which would allow them to dive down into the water to feed as they worked to survive the brutal winter. Because it was such a difficult winter, many birds did die. A few were seen here on this day, scattered on the ice, nearby the living. It was hard to look at, a real, honest reminder of the realities of life. But I tried to focus on the living. It was exciting for me to see both of these uncommon birds, and so close-up; they tend to stay far out in the water. So when I heard about the chance to see them, I knew it was a rare opportunity and I had to take it. Looking back at the pictures I took of the icy water at the end of the day, it amazes me how beautiful life can be, even in the most adverse of conditions. Take those little opportunities to stretch your comfort zone and you might just be surprised at what amazing experiences you can have. Last winter taught me that lesson, and I am glad. OMG this is amazing. You have to watch this! This video shows the tsunami as it comes inland in Japan and then as it gets sucked back out. The power of the force of the water is scary. There is water, there is fire, there is destruction. I can’t believe the people who stayed around as this was happening, I wonder if they were advised to leave or not? Maybe the structures were known to be safe? But you have to wonder about electricity and gas as dangers, I mean look at the ending! How could you survive if you were stuck in that? !